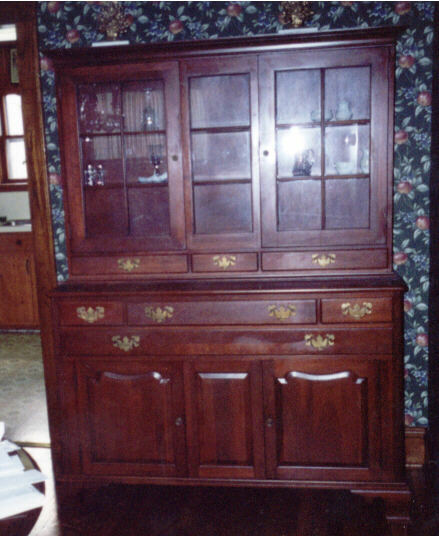 The Photo below shows my Wildwood Cherry Buffet. 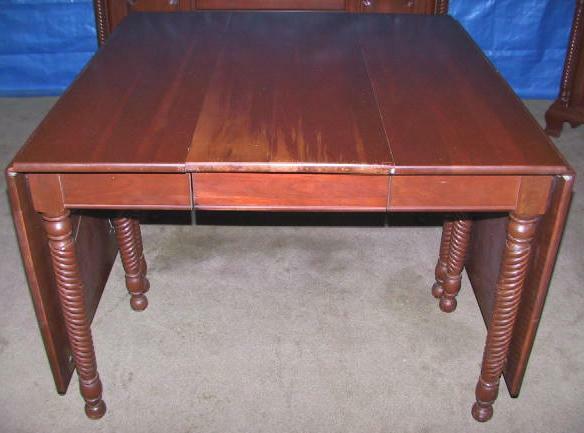 It is in pristine condition and has the famous "rope motif" trim. 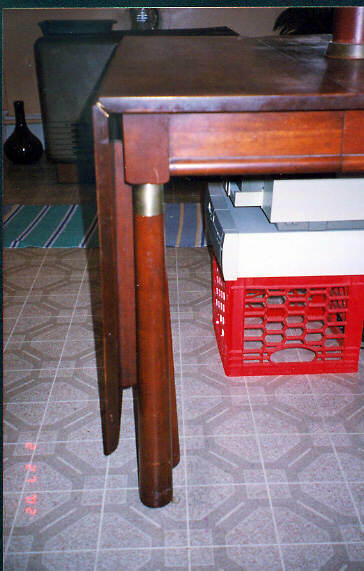 The following photo shows my drop leaf table. Note the center cut to accommodate the extra leaf. 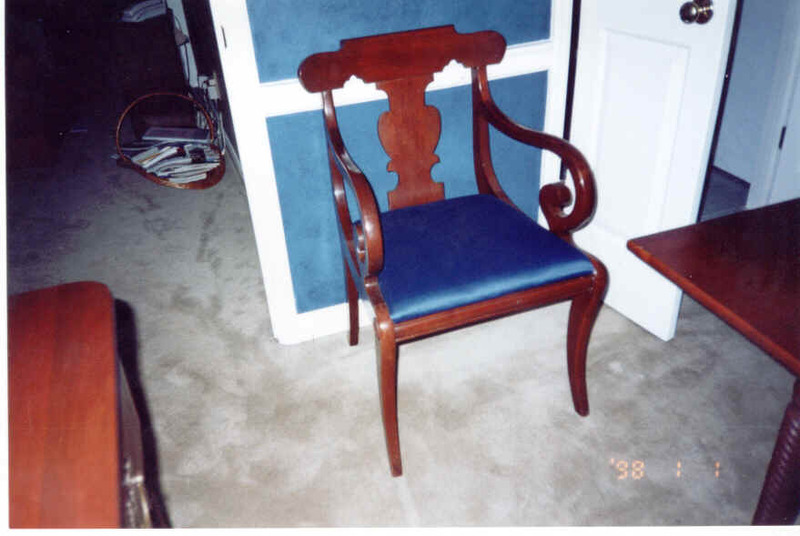 The following pictures show my chairs with the "urn-back"
The arm chairs are slightly taller and wider than the side chairs (the base of the urn is lengthened). The arm chair is very sculptural with a decidedly "50s contemporary look, and the spiral arms are distinct. 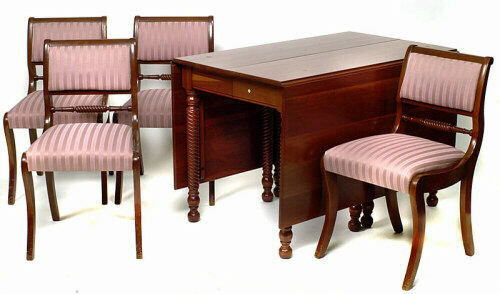 Note the circular raised carving on the top of each front leg (not present on rose-back or lyre-back chairs. 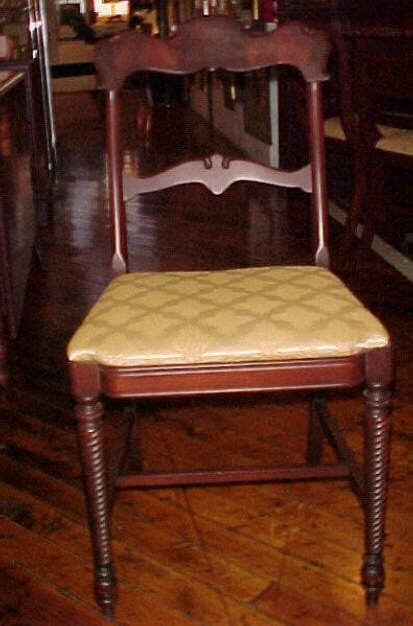 Here is another urn-back chair. I have a hunch that the upholstery material on this chair is the original fabric (Photo courtesy Louisville Antiques Mall). 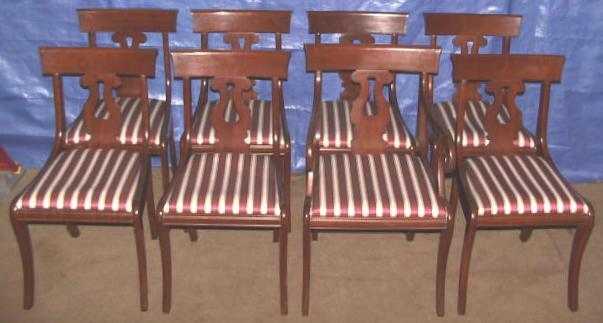 Here is another photo of the 8 swain chairs. 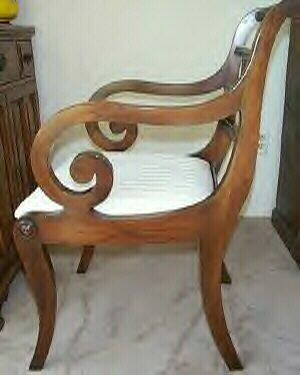 Note the swirl arms on the arm chair. There is one arm chair, taller and slightly wider than the side chairs. 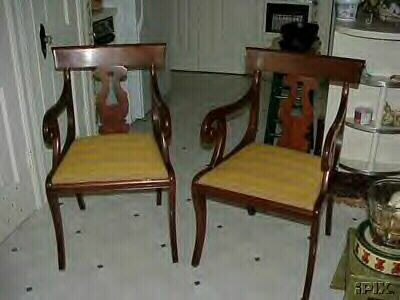 This photo shows a pair of Lyre-back arm chairs auctioned on e-bay December 2001. 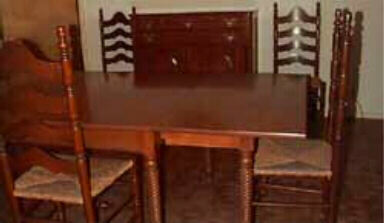 Compare the arm design on these chairs with the arm design on my Urn-back chairs, above. Though both use a spiral design, the details are quite different. 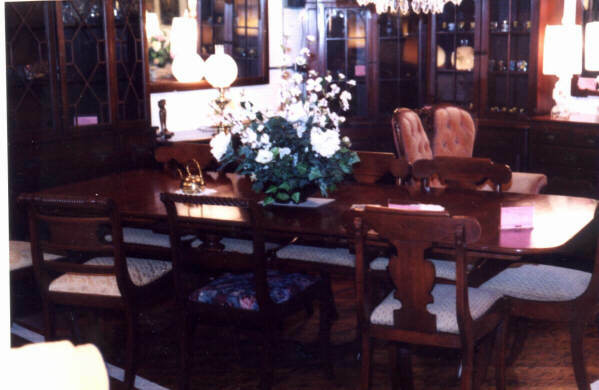 This shows the table and four "rose-back" side chairs that was auctioned October 9th, 2001 by Thompson and Riley Auction House in Lexington, Kentucky. 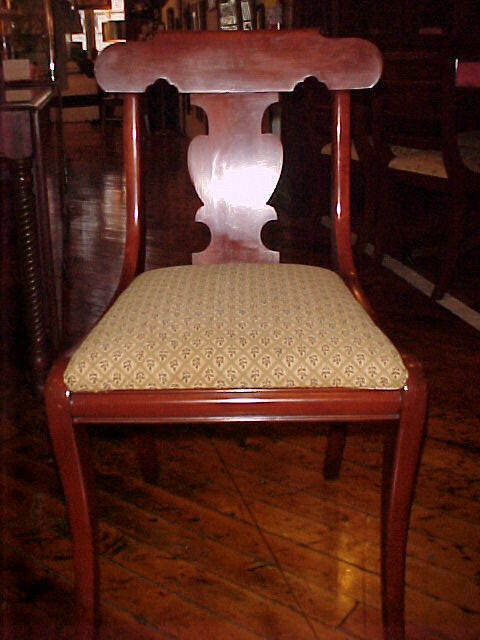 The back of the chairs features a prominent carved rose. Slats go sideways instead of up and down. Note also that this table has no leaf, nor provision for inserting one. (Photo courtesy Thompson and Riley). 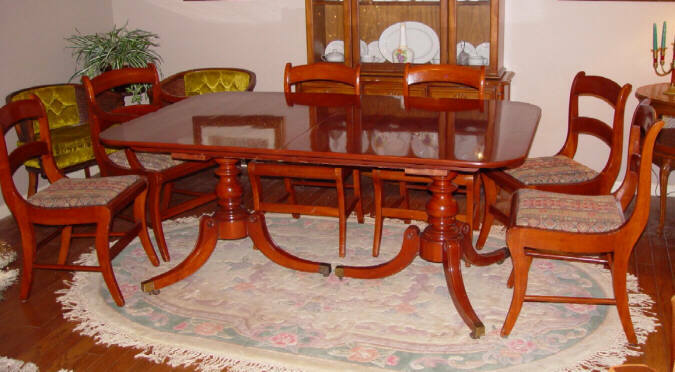 This photo shows Rebecca Beatty's dropleaf table and roseback chairs purchased at the Louisville Antiques Mall January, 2002. It has the leaf We think the fabric on the chairs is original. 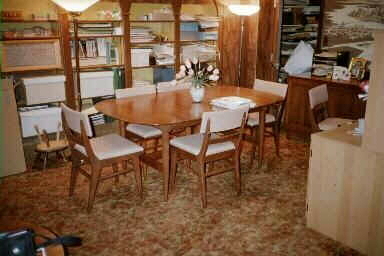 The following photo shows the Swain table with the leaf installed. 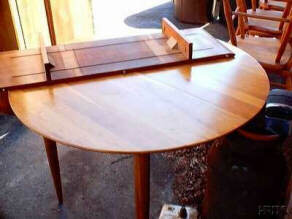 Note that unlike the Thompson and Riley table, the center is cut to accept the leaf. 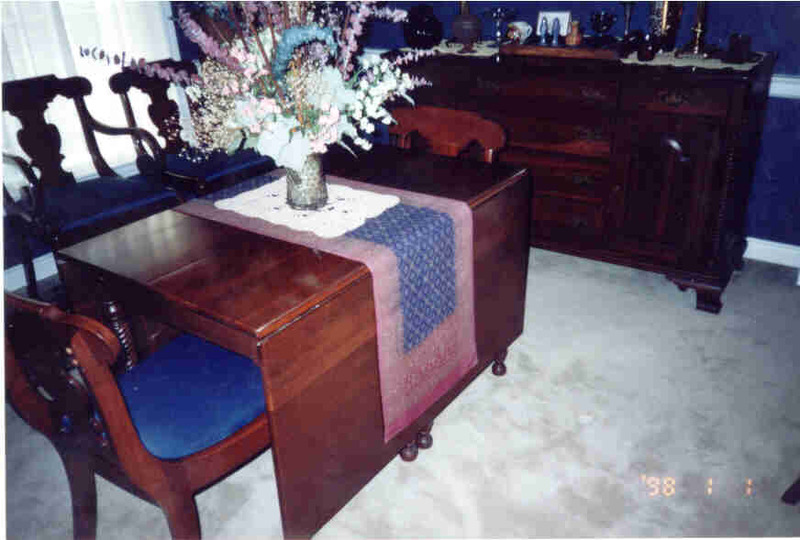 I am indebted to Sue Hayes of Dixon, Tennessee, who sent me these three photos of her Willett drop-leaf table with a turned leg that is quite different from the rope leg. 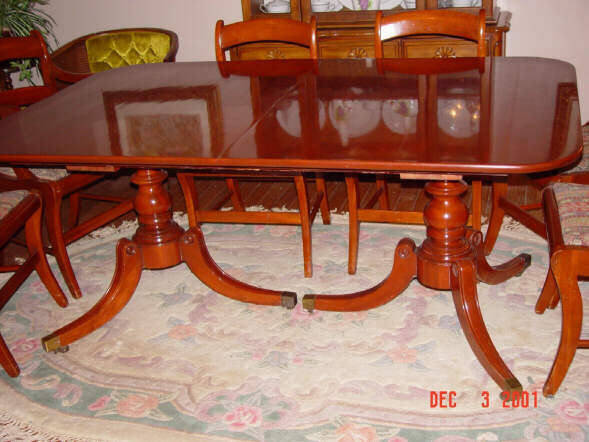 Here is a rare Willett Banquet table Rebecca Beatty saw at the Louisville Antiques Mall. Note both the rope back and the urn back chairs. 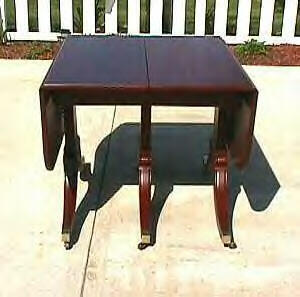 IT's difficult to tell for certain, but i think hte table is the same design as the one pictured below. 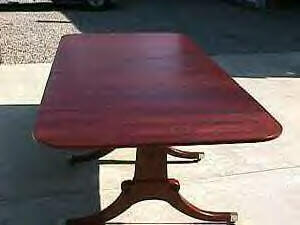 Here is a banquet table and Roseback chairs being auctioned on e-bay April, 2002. The two outer pairs of legs I believe slide out to support the two fold-down leaves, rather than fold out at a right angle as in the regular Willett dropleaf. 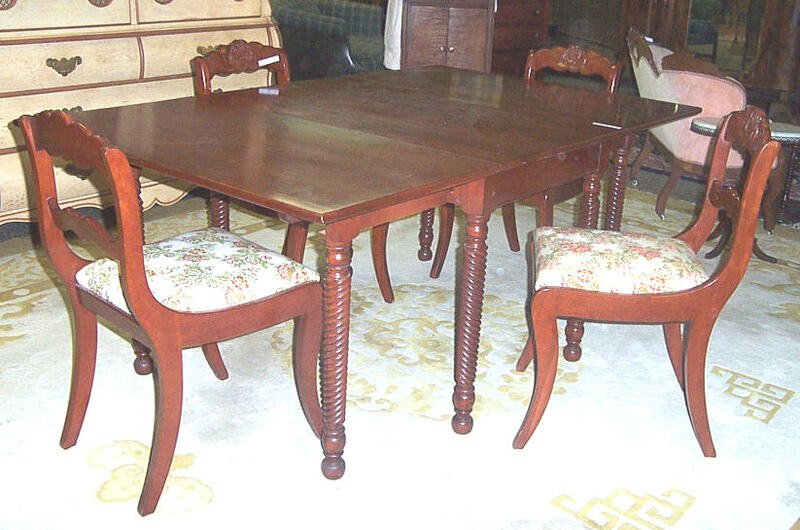 According to the seller, these pieces have been professionally refinished as but close as possible to the original Willett finish. It looks as if they did a very good job. Note the four armed Roseback chairs. 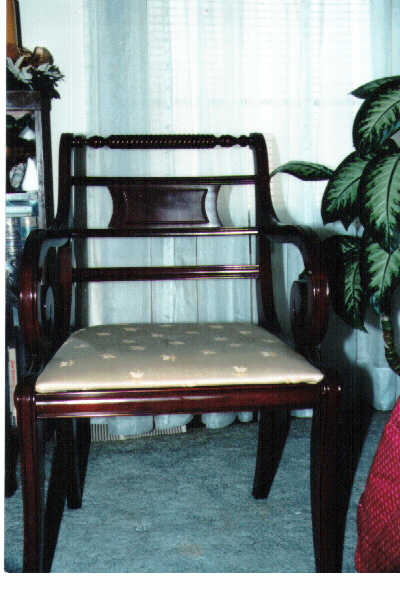 This photo shows Willett chairs with the rope motif along the top of the back. 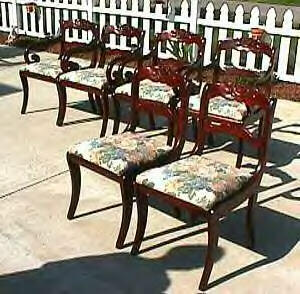 These are actually the true chair match for the rope motif drop-leaf table. The slats run horizontally rather than vertically. with a wider board in the center. 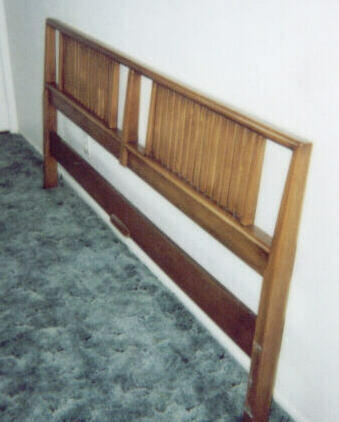 The Rope design is similar to that on the footboard of the bed pictured further down. 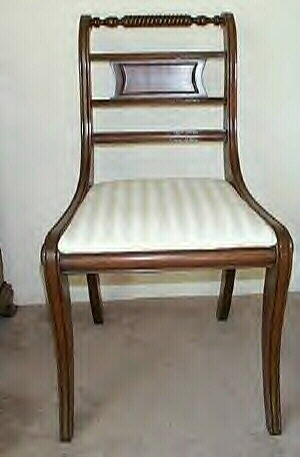 The circular carving on each side of the chair is the same as on my urn-back chairs. 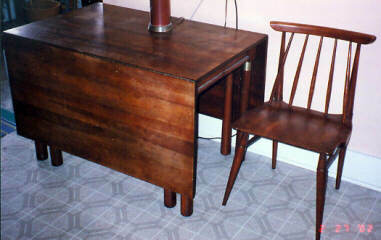 This photo also shows a drop leaf table and a small server. 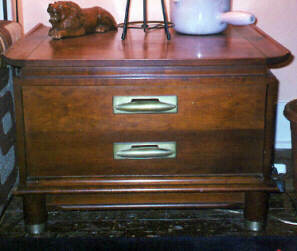 In addition there are two 2-drawer end tables with turned legs. 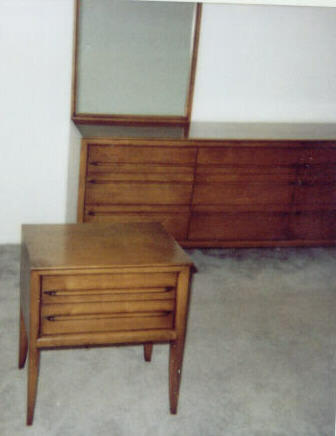 I am not certain which collection the server is from, but it appears to be consistent with the Marblehead collection, as do the end tables. The top of the door panels are square rather than curved but there are handles with backplates rather than pulls, I am indebted to Rebecca Beatty for finding this photo on the Web. 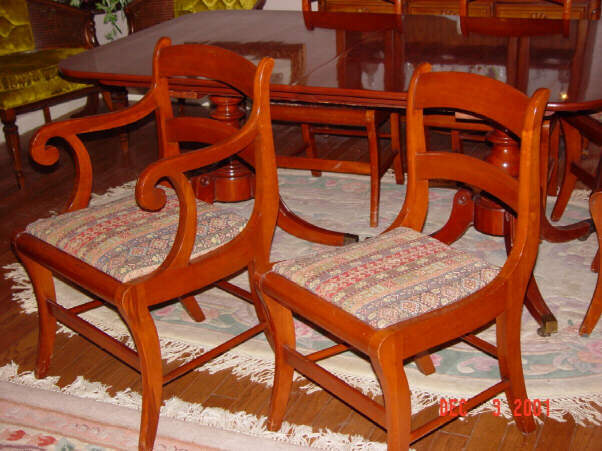 These are Julia Anderson's rope-back Willett chairs. These are currently For Sale as part of a set that includes a rope-leg drop-leaf table as well. 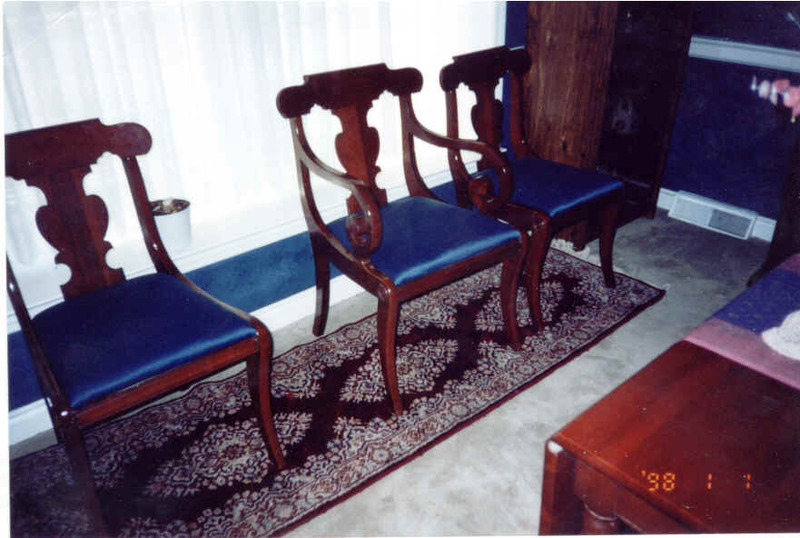 Here are three views of another set of rope-back Willett chairs. 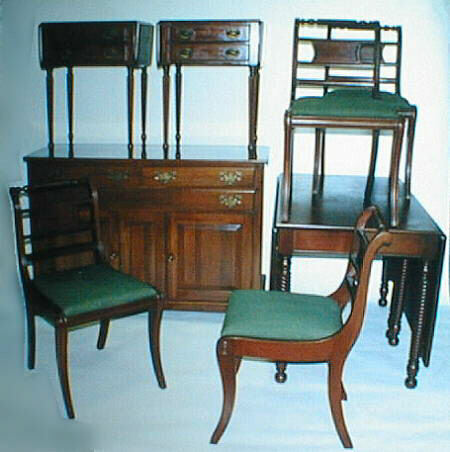 This photo shows Willett chairs with padded backs along with a drop- leaf that could accept an extra leaf. 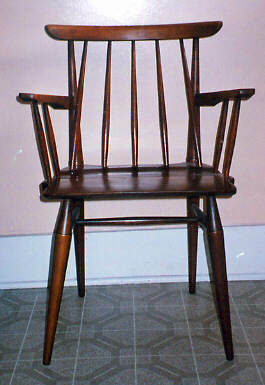 Note that the horizontal back rail at the top of the chairs is smooth, but the rope motif reappears on the lower back rail. This is a very beautiful design. Interestingly, the circular carving is absent from the sides. This photo shows the tall Hutch in the Swain set. It is a beautiful piece and also has the rope motif. 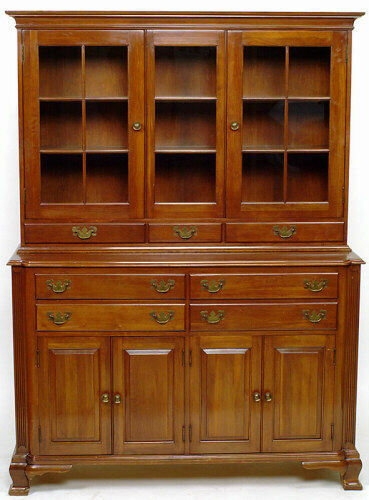 An identical hutch sold for $1,200 at a September 11th, 2001 Thompson and Riley auction in Lexington, Kentucky and is from the Wildwood collection. This set was being sold on the Internet. The owner claimed it was Willett. 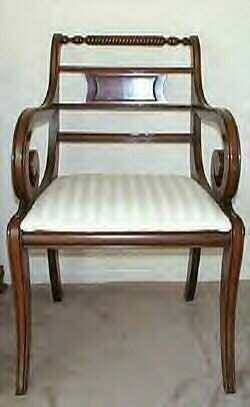 The chairs seem to be a mixture of a Windsor and early American design. 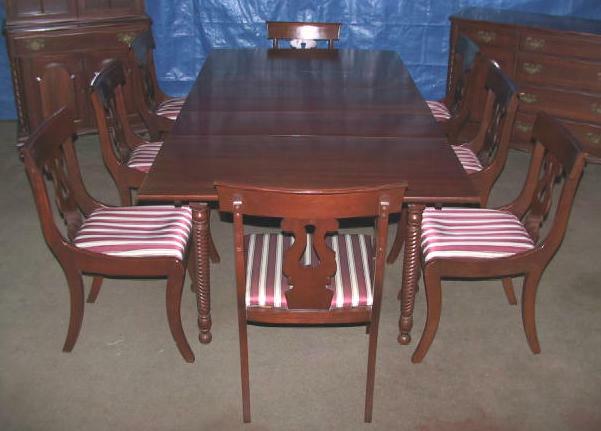 These chairs are in the brochure describing the Marblehead collection. 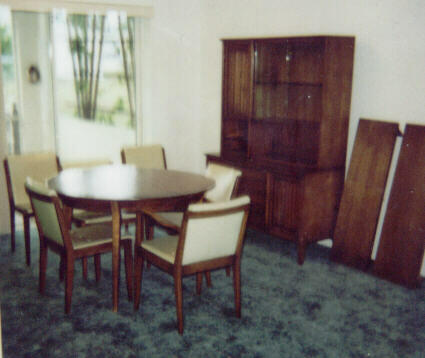 This photo shows a Willett drop-leaf table and buffet (possibly Jackson Press) as well as some Willett ladder-back chairs. The Willett chairs are quite different from most of the Willett chairs we have seen, with a taller but more informal, design, and having a reed rather than a padded seat. 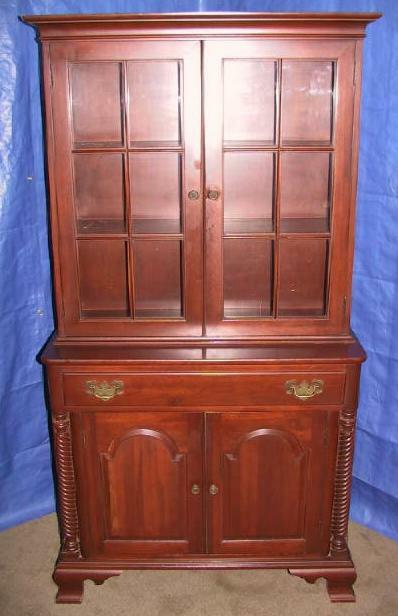 This is a gorgeous arch-window Willett corner cupboard from a Cape Cod seller. It sold for only $860 on e-bay There is no rope motif on this piece. I'm thinking that this is likely from the "Elswick" collection, as the door panel design and pulls are similar to the breakfront below that has been identified as part of that collection. 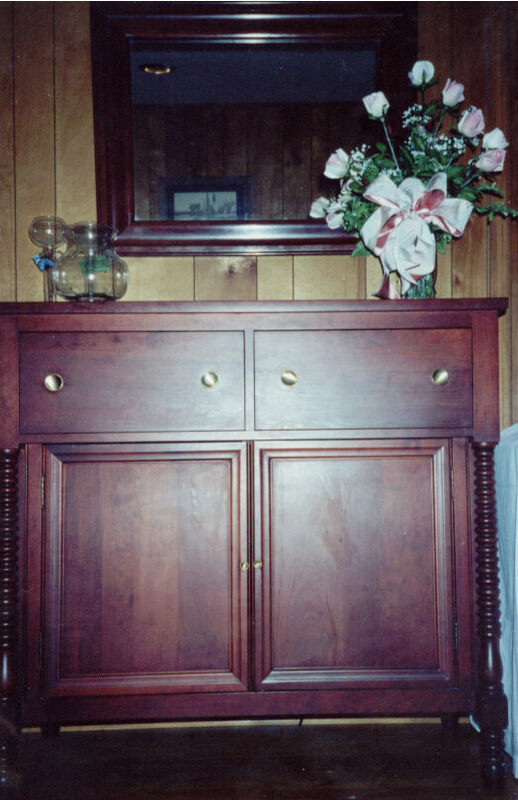 An identical corner cupboard sold at the Thompson and Riley Auction, December 4th, 2001. 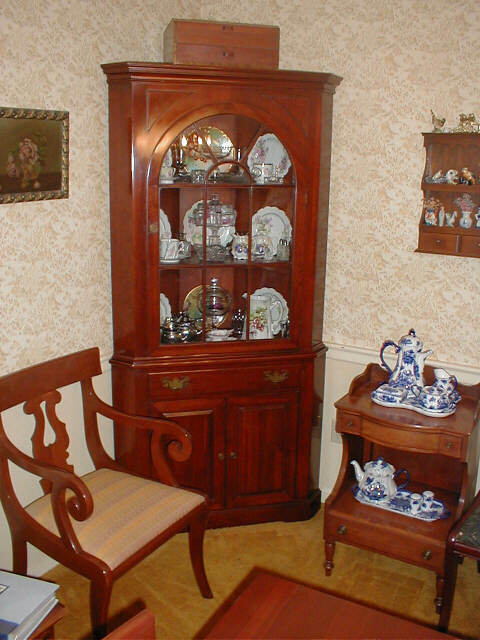 This is a similar Willett corner cupboard, along with a lyre back chair and table/night stand owned By Charles and Linda Hudson of Nicholasville, Kentucky. Charles tells me that his wife's mother purchased this at Purcells in Lexington Kentucky, a leading department store, in 1948. It is listed in the 1948 catalogue as one of 'The Old Kentucky Home Group.' 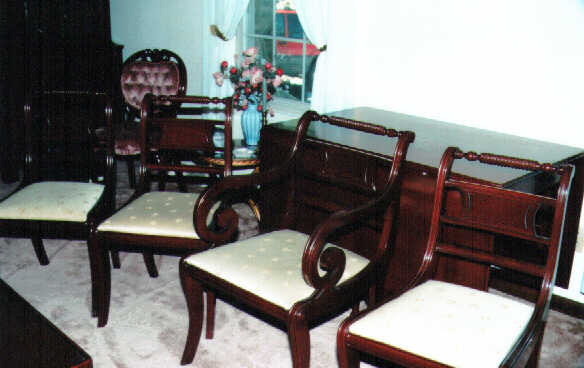 From this grouping one could choose four different chair styles; three table styles; two buffet styles and three china cabinets as well as the corner cupboard and also a small server with either drawers or doors. All of these were made in the Wildwood Cherry. 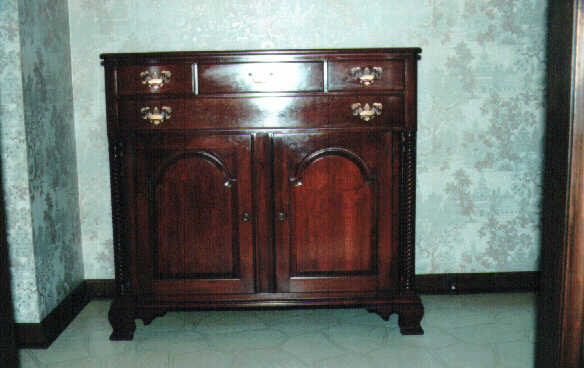 Here is a cherry corner cabinet that sold on e-bay for $1682. It has the straight rather than arched door. 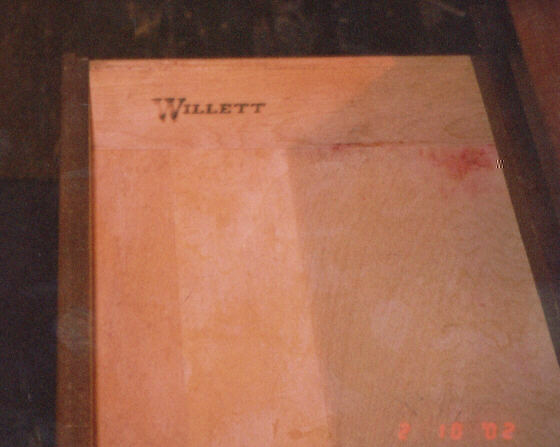 This is a Willett breakfront that appeared on the Web. Thanks again to Rebecca Beatty for locating the photo. 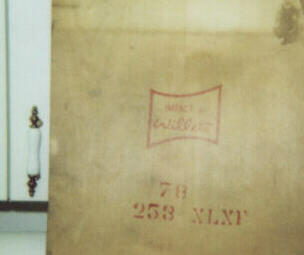 Rebecca tells me that this was identified as being part of the Elswick collection. 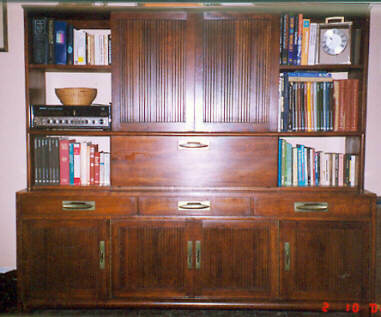 The overall design is somewhat like the narrow Swain Hutch, above, but it is wider. Note, however, that the doors are horizontal rather than curved at the top. Most interestingly, grooved fingerboards on both sides appear instead of the rope trim. 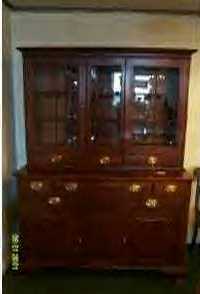 This is an open-top hutch that was auctioned on e-bay by Columbus Antique Warehouse Nov 2001, now owned by Rebecca Beatty.. They refer to this piece as a "pewter cabinet." It appears to not have the rope motif trim. Note the rather different "sway-top"door panel design. 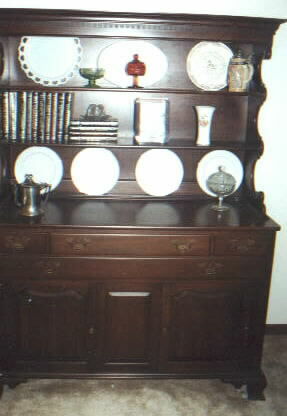 This is the buffet owned by Sue Hayes of Dixon, Tennessee. It carries the same design themes as the hutch above, and the pewter cabinet below. Note how design elements differ from the rope motif buffet. 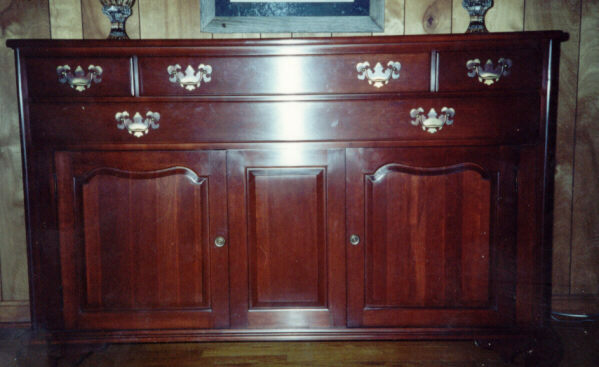 There is a second long drawer that runs the entire length of the buffet, and what appears to be a fixed center panel. The doors have the sway-top rather than cathedral panel design. 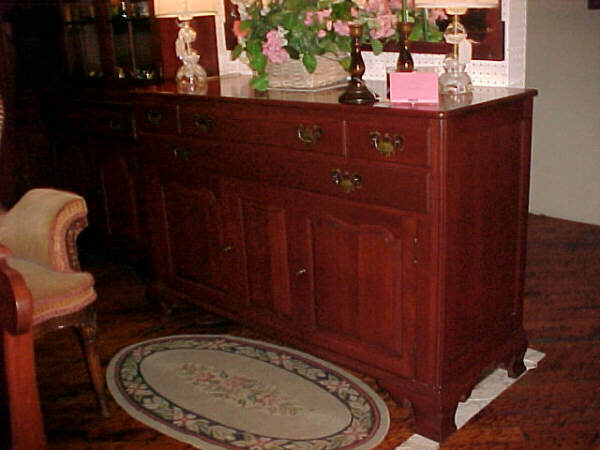 This is a buffet from the same collection for sale as of January 2002 at the Louisville Antiques Mall. The China cabinet drawer has the embossed metal Wildwood sign. 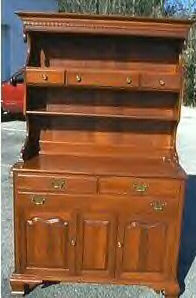 This is a Willett open-top Hutch that was for sale on the Internet. 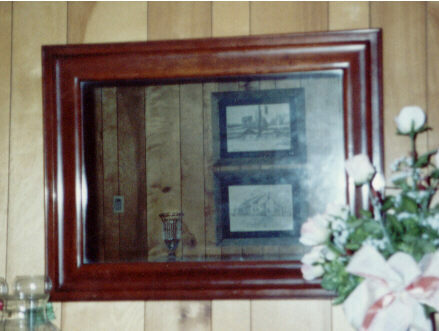 It is similar in design to the Willett pewter cabinet above, but is wider. Note the sway-top design of the raised panels which is consistent on these three pieces. 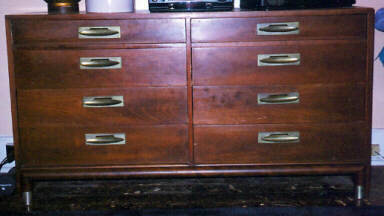 The bottom appears to be identical to the Sue Hayes Buffet, above. The crown and dentil moldings at the top appear to be identical to the Pewter cabinet too. The rope motif is not present. 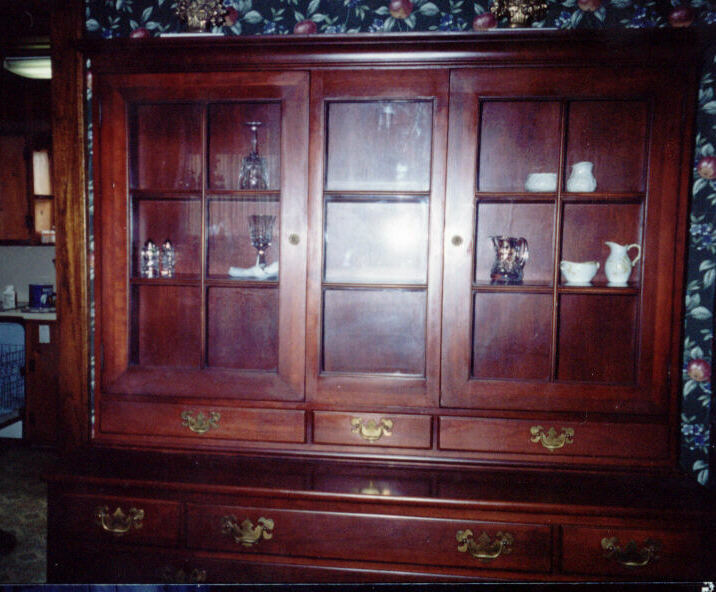 This is a somewhat grainy photo of a Willett China cabinet with glass doors. According to the owner, the pulls are not original. Note again the sway-top panels in the doors as in the photos above and the absence of a rope motif. Sue Hayes has a Willett Mirror above the Jackson Press. This mirror appears to have been sized to be appropriate for this particular piece of furniture. 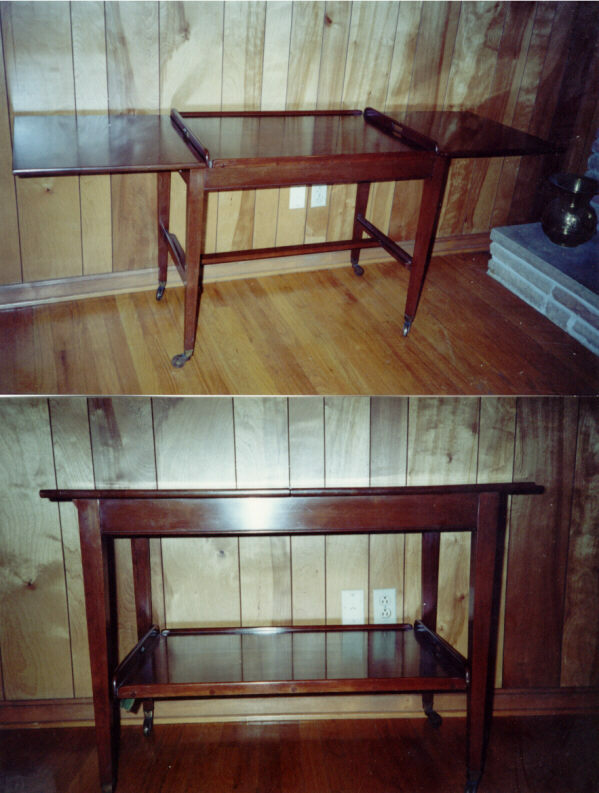 These photos show two views of a Willett Server with a flip-out top, again owned by Sue Hayes. This is a Jackson Press owned by Julia Anderson. 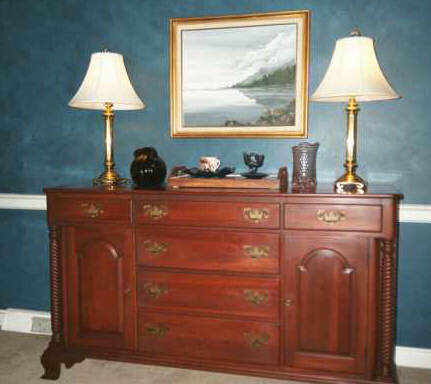 It is styled very much like the Willett Buffet, but lacks the center set of drawers. Note the Rope trim. This item is currently For Sale. 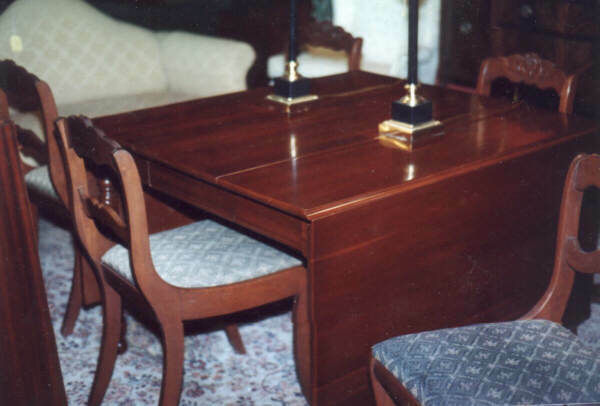 The owner has verified that this table chairs and buffet are from the Transitional line as the Table is stamped with that on the underside. . 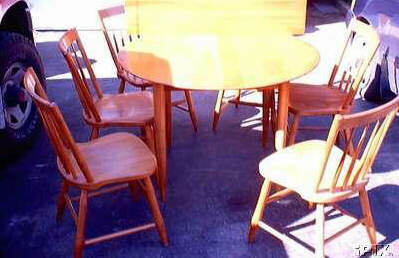 Here are photos of a round table and chairs from the Transitional line, For sale on e-bay, March, 2002. 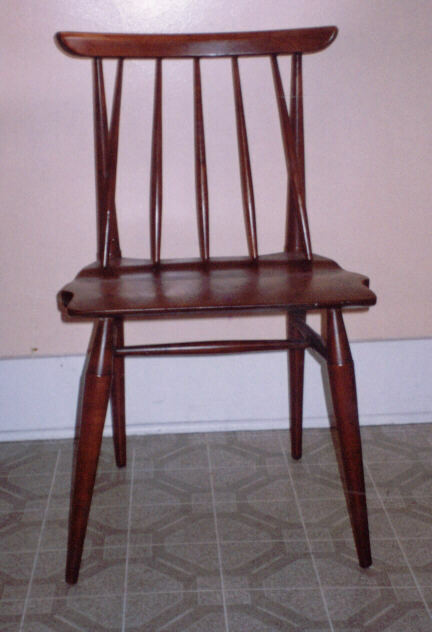 This photo shows the Trans-East dining chair with arms. 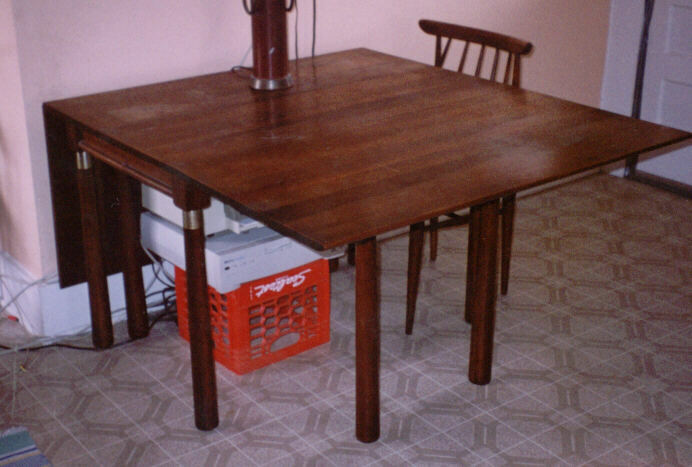 This photo shows the dropleaf Trans-East table and a side chair. This photo is another shot of the dropleaf Trans-East. 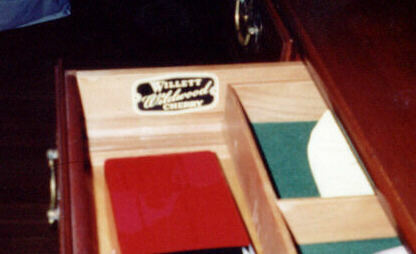 The inside of the drawer of the hitch/storage wall is marked Willett in brown ink but no mention is made of the Trans-East collection. 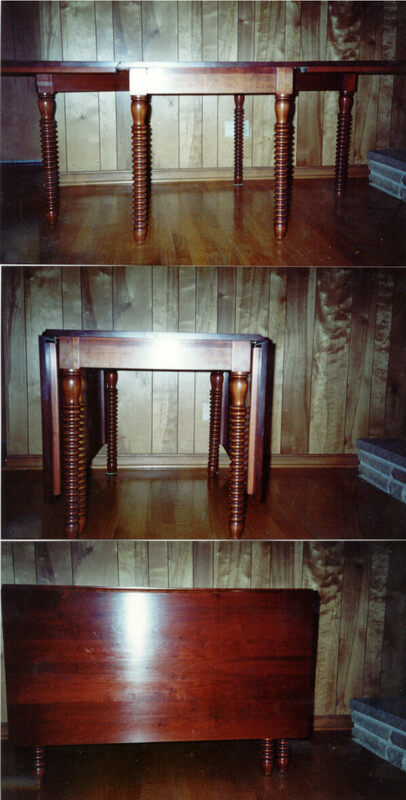 Linda Nash of Cape Coral FL sent photos of her father's furniture from the Willett "Impact" line. She dates this to 1956 or 1957. It has similar design features to the Trans-East line although I have not seen it listed in any of the advertizing. 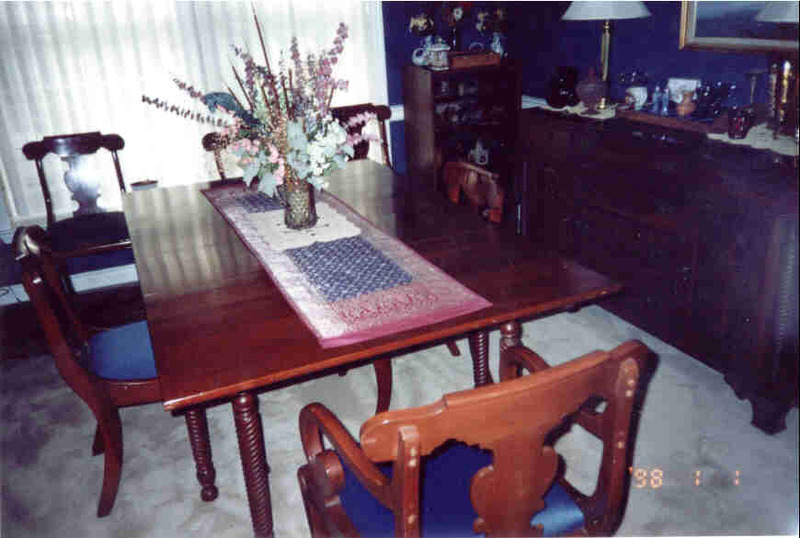 There are both bedroom and dining pieces.